Or dinner, or breakfast, or snacktime… this page highlights specials submitted by USC Hospitality restaurants or the eateries of USC Village. Note that you can receive USC Hospitality specials via weekly email – and see the locations and hours of all Hospitality restaurants on the Hospitality site. Catch the next of your favorite “takeovers” at Verde! Instead of your usual Mexican-inspired cuisine, mix it up on weekdays and enjoy Mediterranean food the week of April 29. Tutor Hall, Cammilleri and Popovich cafes all now feature Porto’s Pastries, fresh daily! Learn more on the Hospitality site. 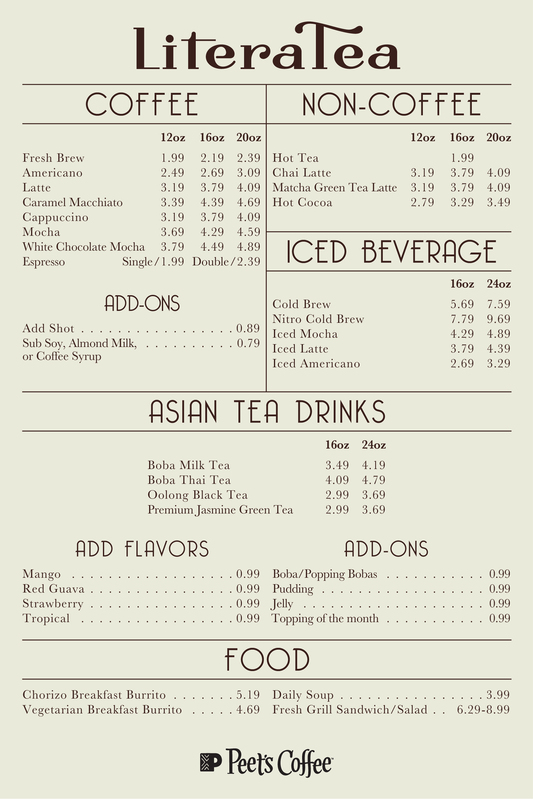 Literatea Café now has boba tea! Literatea is located in the Nazarian Paviliion behind Doheny Memorial Library, a quiet location for an afternoon tea – see the menu. (And of course, enjoy your tea sooner by ordering through Tapingo). Skip the line: download the Tapingo app and order on-campus food for pickup. Get $1 off your first order with code FIRST.